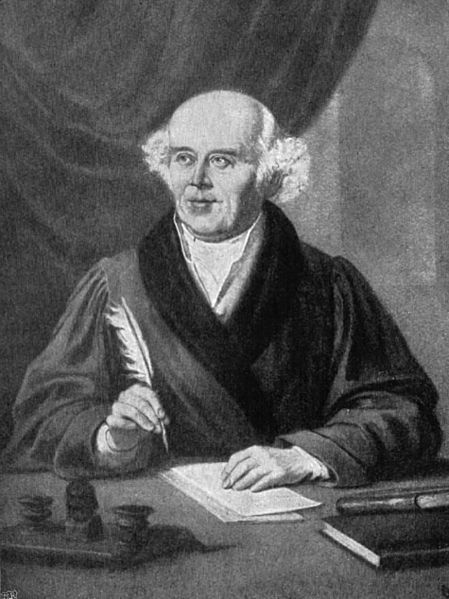 In the United States, Christopher William Hufeland (1762-1836) is little known in homeopathic history, except by those few who are familiar with Hahnemann’s first works and publication in the old style German. Hufeland was the editor of a periodical that was distributed when Hahnemann began writing down his philosophy of homoeopathy for the first time. Hufeland has a lengthy history in academia in Germany. He studied medicine in Jena and Gottingen, becoming a Doctor in Medicine in 1783. In 1784 he began to develop his affiliation with the infamous Illuminate sect in Europe, and made contact with a number of very important leaders in the spiritual and mystic communities in Europe. Over the next 12 years, during his years of work in the clinic as a physician at Hofrat and Leibmedikus and later Hofmedikus in Weimarhe, he made contact with some of the most important leaders for their time. 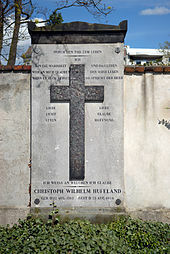 Those he treated whom were most important to the philosophical communities included Johann Wolfgang von Goethe, Friedrich von Schiller, Johann Gottfried von Herder and Christoph Martin Wieland. With the French Reformation now just around the corner, his affiliation with some of the most honored spiritual leaders in Western Europe led to his success as a Honorarprofessor for the Universitat Jena, a position he held from 1793 to 1801. 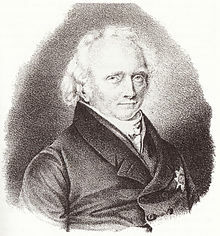 In 1800 he began work for a short while with the Akademie der Wissenchaften, and ultimately became affiliated with a number of medical and teaching centers in and around Berlin. Employed by the medical school in Berlin, he made his way into the upper echelons of this setting by serving as Dekan (Deacon) for the medical faculty (facultura Medizinischen Fakultät als Akademiemitglied) of the new medical school in Berlin. He next took a position as professor of Pathology and Therapeutics and began work with the governmental run Militärakademie in Staatsrat. One of his most important contributions to medicine during this time was his work as an early hygienist for soldiers of the Prussian-German military. He managed and developed new treatment protocols for individuals who had consumption or tuberculosis. This remained the focus of his practice for the next 30 years, during which time he personally treated more than 1000 patients. Hufeland’s association with Samuel Hahnemann, the inventor of homeopathy, began during as a a result of his years of contributions, first as a writer and later as an editor of some of the most important books and journals for his time. 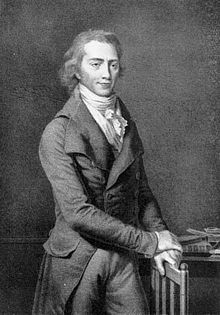 In 1795, his contributions to the metaphysical aspects of medical philosophy and theory began with the publication of Mesmer und sein Magnetismus, in which animal magnetism was defined and described. His next work two years later focused on “der Pocken”, assorted diseases which display themselves as small marks on the skin. In 1787 a book on hygienic medicine and it association with disease was published, and immediately linked to the much earlier philosophy developed 70 years earlier by Lady Mary Wortley Montagu–Die Haremfrauen infizieren ihre Kinder absichtlich mit Pocken (1717) [see http://www.br-online.de/ratgeber/gesundheit/diphtherie-polio-pocken-ID1288720874767.xml]. In this work, Lady Montagu queried into the Turkish method of preventing small pox. By 1796, the proofs required for “Ausrottung der Pocken” (inoculation of pox) to become part of the preventive or hygienic health practice by Prussian-German physicians were in place. These events also set the stage for the philosophical transition needed to happen in order to Samuel Hahnemann to invent his philosophy of Homeopathy. 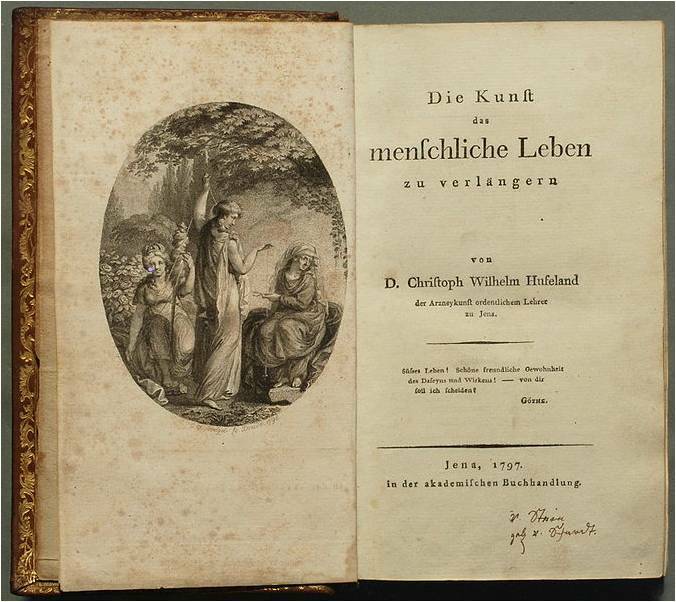 In 1796, Hufeland’s most important work, Die Kunst, das menschliche Leben zu verlängern [The Art of Prolonging Life] was also published. The original edition–it wouldn’t be until several decades later that this book was translated into English. By 1805, Hufeland’s work led to the development of a “Makrobiotik” life style, with some of its roots generated and promoted heavily around 1795 in Journal der practischen Arzneykunde und Wundarzneykunst. His work also gave rise to concepts referred to as “Heilkraft der Natur” (vis medicatrix naturae), Anwendung von Diätetik (nutrition or diet therapy) and physikalischer Therapie (physical therapy). Hufeland’s work promoted gymnastics and exercise, the effects of climate on disease, and the effects of living a healthy lifestyle of prolonging longevity. Essentially all of the requirements for the modern nature cure and naturopathy practice were defined and then reviewed in detail by Hufeland’s work. Just a few years later, Samuel Hahnemann’s additions to this philosophy (“Die Homöopathie“, for which see http://de.wikipedia.org/wiki/Hom%C3%B6opathie) would be promoted by Hufeland and these two very similar philosophies merged into a single discipline. The above history confirms a theory I have been proposing for several decades–the success of the inoculation is what led Samuel Hahnemann to define his philosophy of homeopathy. 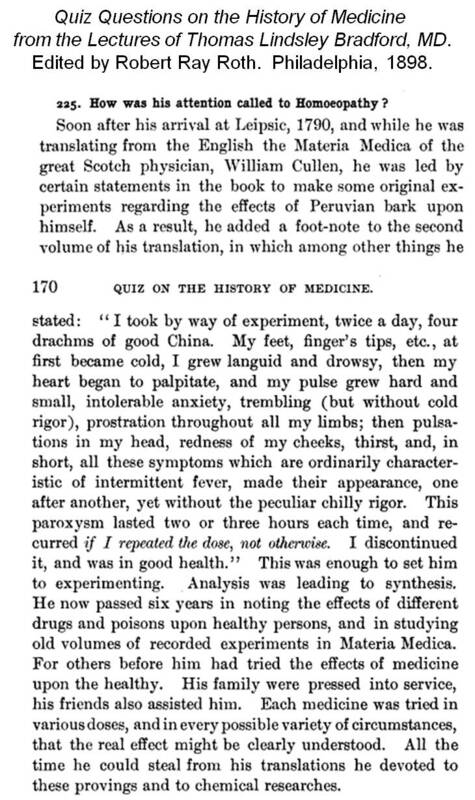 The traditional tale of the history of homeopathy (which follows at the end, and is extracted from Bradford’s Quiz Questions on the History of Medicine (1898), is missing important parts of this story. These two practices–inoculation and homeopathy–currently have two completely different sets of scientific principles underlying their uses and professional support in contemporary medicine. Inoculation we know works due to small proteins in the blood known as antibodies. The presence of anything like a protein in the body was unknown during the 18th and very early 19th century, the period when inoculation was becoming accepted and ultimately popularized and even required in the early 19th C military settings. At one time, the philosophy of how and why inoculation and homeopathy worked were based upon the same single scientific philosophy, based on the vital force concept with a little bit of “animal magnetism” teachings thrown in as well perhaps. Applying the more contemporary jargon to explain this common human behavior, these two beliefs systems were based upon the same theory. This was also shown to be the case in some earlier reviews I did of the early to mid German publications on Homeopathy found in the medical school library at the National College of Naturopathic Medicne in Portland, Oregon, about 25 years ago. In some journals edited by Hufeland, with articles by Hahnemann, we find Former late Colonial New York Governor Cadwallader Colden (by then deceased) cited in the German writings on homeopathy published out of Jena. Samuel Hahnemann himself recognized Colden’s metaphysical emphasis on the beliefs as to how medicines worked, and Colden’s claim that the same metaphysical causes for disease could manifest themselves in different ways (Colden used this to equation such diseases as measles, small pox, fevers, and a diphtheria epidemic in Kingston, MA, to a single internal energy-related cause). Colden’s work was very popular in the Prussian-German parts of Europe due to Colden’s strong devotion to their metaphysical philosophies and vice versa. By 1796, as noted in Hufeland’s writings, this belief had become known as the vital force concept. It has some direct links as well to several other Western European belief systems, but especially one promoted by Dutch Vitalist Borden (reviewed along with Dr. Osborn, whose practice and vade mecum note links to this philosophy as well).